Studio Athletica | Downtown Toronto Low Back Physiotherapy - Call Now. Below you will find a list of some conditions that we see at Studio Athletica with our Downtown Toronto low back physiotherapy clientele. It is not uncommon for athletes to sustain injuries in areas that are normally not seen in people until their later years as they age naturally, however, vigorous sports and physical activities can accelerate the process in athletes. If you are experiencing health issues affecting your low back area, below you will find a list of related symptoms and conditions. At Studio Athletica, we specialize in several different services that can help treat your health problems. Please feel free to read more about your symptoms, conditions and our suggested treatments, or contact us to pinpoint the best treatment to heal your body. The downtown Toronto low back physiotherapy program is the gold standard. Our Downtown Toronto low back physiotherapy program sees a lot of muscle strains. A muscle strain (pulled muscle) in the low back occurs when the muscle fibres endure strenuous activity beyond their limits. Both professional and amateur athletes may experience muscle strain when sprinting, stretching or changing direction quickly. Mild muscle strains will usually result in soreness and swelling. Additionally, the range of movement around the affected muscle may be inhibited. More serious strains will cause considerable pain and severe restriction in movement. Our Downtown Toronto low back physiotherapy program sees a lot of disc disease & hearniation. Our spinal discs will degenerate as we age which may lead to degenerative disc disease in some people. Degeneration can include the loss of fluid in your discs which can decrease the shock absorption of spinal discs and their flexibility. It can also lead to tiny tears or cracks in the outer layer of the disc. These changes are likely to occur in people who are involved in physical sports such as weightlifting. A sudden injury leading to a herniated disc (such as a fall) may also begin the degeneration process. A herniated disc happens when a disc is damaged, it may bulge or break open. Our Downtown Toronto low back physiotherapy program sees a lot of facet joint sprain. 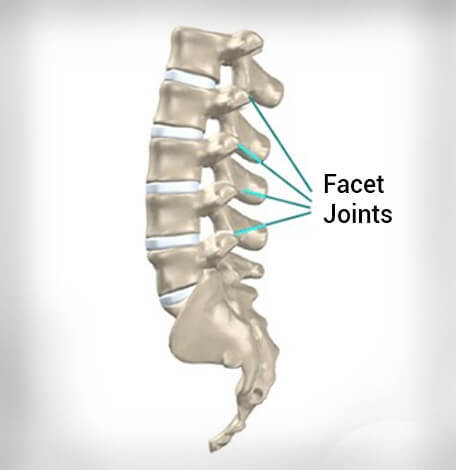 Facet Joints are located in the back which help support and control the movement between the individual vertebrae of the spine. Facet joint sprain in the low back can happen when the cartilage surrounding the joint becomes damaged or tears when a excessive force is placed on the facet joint. This type of sprain is typically seen in athletes who perform excessive amounts of bending, lifting and twisting movements, such as gymnasts. Symptoms include a gradual onset of back pain, aching, and stiffness. Pain could also be felt in the chest and rib cage. Our Downtown Toronto low back physiotherapy program sees a lot of compression fractures. 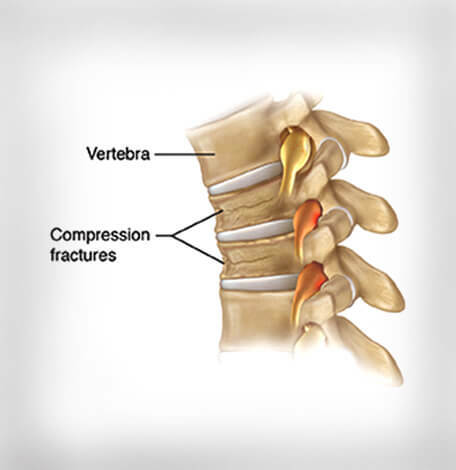 A compression fracture in the low back occurs when the bone collapses – typically short bones, such as the vertebrae in the spine. Osteoporosis is a condition that causes thinning of the bone tissue and loss of bone density. It’s the most common cause of compression fractures of the back. It usually affects people as they age naturally however, the process can be accelerated in athletes who are involved in vigorous contact sports. People who lead an active lifestyle, weight lift, or participate in contact sports should undergo screening for Osteoporosis to maintain the strength of the bones. Our Downtown Toronto low back physiotherapy program sees a lot of spinal stenosis. 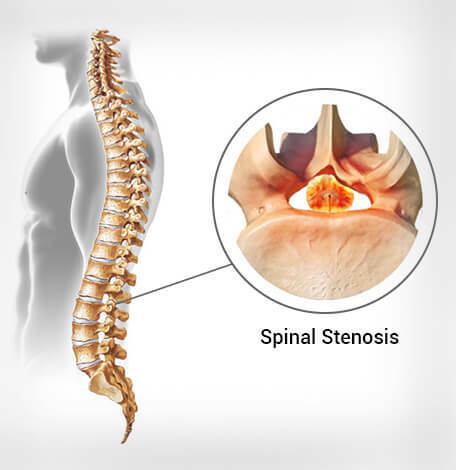 Spinal stenosis is the abnormal narrowing of the spinal canal that can put pressure on the spinal cord and the nerves. If the pressure is on the lower part of the spine, the symptoms can feel like pain or numbness in the legs. If the pressure is on the upper part of the spine, the pain and numbness most likely will be in the neck and shoulders. People with more severe cases of spinal stenosis may have trouble with their balance and may have difficulty controlling their bladder and bowels. Our Downtown Toronto low back physiotherapy program sees a lot of spondylolisthesis. In spondylolisthesis, one of the bones in your spine, called a vertebra – slips forward and out of place. 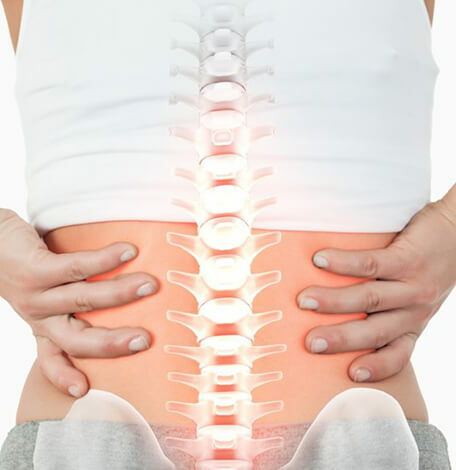 Symptoms of spondylolisthesis include pain the the lower back or legs, tightness in the hamstrings, numbness and tingling sensations in the legs. Sometimes when a vertebra slips out of place, you may feel no symptoms at all or no symptoms until years later. Then, you may start to feel the gradual pain in your low back, buttocks, or legs. This can be caused by joint damaged, an accident, or other trauma, such as a hard hit sustained while playing contact sports. Our Downtown Toronto low back physiotherapy program sees a lot of pinched nerve. Also known as compressed nerve, sciatica develops when one or more nerves are compressed or constricted by a bone, muscle, cartilage, or tendon. Although most people associate it with the neck or back, it can happen anywhere. Pinched nerves can occur in areas that are overworked such as, the elbows or wrists in tennis players. Regardless of the location, the common symptoms are numbness, tingling sensations, increase pain when walking, standing, twisting, or lifting.